I love poetry, and I really loved reading and writing poetry as a teenager, so sharing poetry with teens in the library is something I love to do. April is National Poetry Month, which presents many opportunities for all sorts of programming in libraries. Here’s a roundup of ideas for promoting poetry in the library. Some are well established and have been done many times before, and others are a bit wacky, because poetry doesn’t have to be dry, boring, or confusing. Poetry should be fun! All you need is a stack of books with the titles creatively and deliberately arranged. Have patrons snap photos of their own, or use it to create a book display. Don’t be afraid to be silly. If I was doing push pin poetry, I would print off many doge memes and random words in Comic Sans and let kids make their own doge-meme-poems. I actually think this makes poetry less intimidating and more accessible, in the way viewing rap lyrics as poetry does. If poetry is “literary work in which special intensity is given to the expression of feelings and ideas by the use of distinctive style and rhythm” then doge memes count. But you could go the more traditional route as demonstrated in this post. You can do this a couple of ways, but the most traditional would be to have a scroll that can be folded up, so that only the previous line or word could be viewed, and invite teens to contribute a line or word to the poem. Then you reveal it all at once. Last year, we had each patron who wanted to check out a video game controller or make a computer reservation contribute a word, and then we scrambled them together to form a poem at the end of the month. Surprisingly, we’ve had kids ask if we were going to do it again! April 24 is Poem in Your Pocket Day! Make a display of pockets, and stuff them with short poems written on rolled up pieces of paper that patrons can take with them, or leave out supplies where they can write their own poems and stash them for others to discover. You could do a standard bulletin board one, but what I really want to do is find a vintage small plastic toy dispenser to fill with poems like this one. Pull all those verse novels and put them on a display! A couple of years ago, we did a “poet-tree” at the library, where patrons could write a favorite verse on a leave and hang it from our “tree.” You can read all about it on my co-worker and friend Rebecca’s blog, Sturdy for Common Things (she also shares fun storytime poetry programs for the younger crowd). Create your own magnetic poetry kits! We did this a couple of years ago at my library, and it was a lot of fun. We used the Hunger Games font and related words, since it was the height of the The Hunger Games mania, but you can do any variation. or font, or just stick with something more traditional. All you need is a printer and paper, modge podge, and some magnets, whether you recycle old promotional ones and cut out individual words or use magnet tape . In high school, I had a really artsy English teacher who was endearing and a bit crazy, and we always did these fun assignments. One of my favorites was a bio-poem, where everyone wrote responses to a set of questions about themselves. I think this would make an awesome library program. Follow these directions to trace an outline of a person on a big sheet of paper, then they can cut it out and fill it with a poem about themselves. This one is so simple. Save some weeded to be recycled books, set out markers, pens, or paint, and let the kids make blackout poetry. We did this last year, and the above picture is an example of a series a teen made and a pocket envelope he put them in. Love it! For further inspiration, check out Newspaper Blackout. Invite teens to compete in a poetry slam, where they can read original poetry or their favorite poems. All you need is a panel of judges and some prizes! We’ve done this for the last few years. Learn technology skills and celebrate a love for poetry at the same time! You know how pretty images with inspiring quotes—many from poetry—are so popular on social media? Help teens make their own by finding creative commons photos and use free online tools to add text to the images. 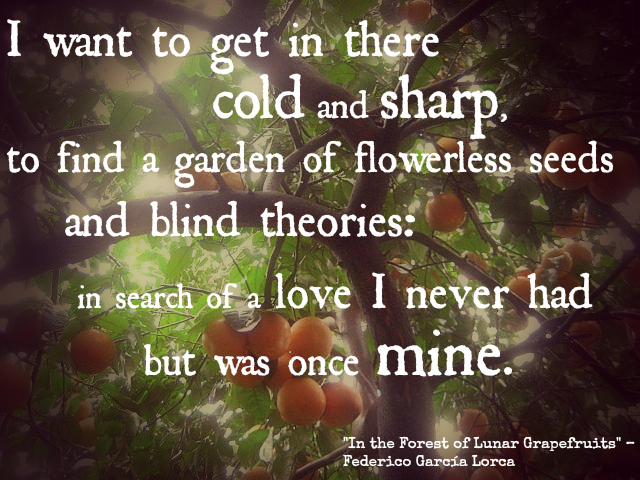 I edited this photo and added my favorite line of poetry from Federico Garcia Lorca’s “In the Forest of Lunar Grapefruits” using Picmonkey. Or, get all artsy and have teens create their own representation of their favorite poem, whether they paint, collage, draw, etc. Share the final products on the library’s social media. 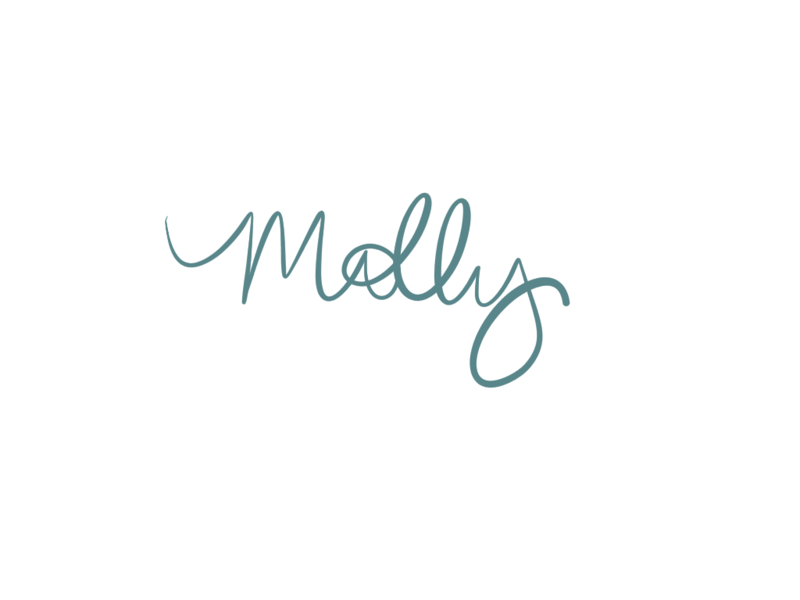 Have a contest where patrons can vote for their favorite and give prizes to the winners. Set out an old-fashioned working typewriter next to a mailbox and envelopes. Invite patrons to type of a short poem to leave, or take one from the mailbox. Do you have any other suggestions for poetry displays or programs? Please share in the comments! I like the pocket idea–maybe I’ll make some pockets for my classroom door!